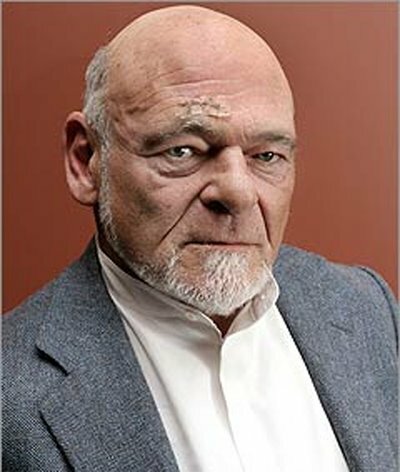 If nothing else, you have to give Sam Zell credit for punching the right buttons among the journalism traditionalists. This has created quite a stir, that the man in charge of some of the most prestigious award-winning newspapers in the country doesn’t think much of using that as leverage for drawing readers back to newspapers. But, if you step back a bit, he makes a good point. After all, if Pulitzers were as highly treasured by readers as they are by the journalism community, then papers such as the L.A. Times and N.Y Times should not be suffering the same fate as the rest of the industry. And, as we’re finding out with L.A., a trophy case full of awards hasn’t stopped the bleeding of readership from newspapers. This is not to say that the basis for journalism awards are not important, but I have long believed that many newspapers have been so awards-focused that they have lost sight of what readers really want. No one has won a Pulitzer for providing outstanding coverage a community’s spirit, or detailed information of the happenings of the local Little League, or giving readers information on a great restaurant in town. Yet in many cases this is what is suffering as newspapers downsize and tighten their scope of coverage. Awards basically stroke the ego of the newspapers and journalists involved. They really do nothing to attract and retain readers. What will attract and retain them is refocusing the energy used to produce award-worthy stories into content that catches your community’s attention and makes them run to your paper or web site when they need a fix of local news. Maybe if someone created an award for that, more publishers would take notice. *I assume we’ll be seeing more of this as the privileged generation comes face-to-face with the end of prosperity. Can’t wait to see how she explains this on her resume! *At least you could call this an “innovative” approach to the newspaper crisis. My take is that Longmont newspaper may soon see a re-enactment of the French Revolution. Are guillotines legal in Colorado? I’ve been worried about the future of the newspaper industry for quite some time now. I’m even more worried today. After reading some of feedback from last week’s “Crisis Summit” sponsored by the American Press Institute, I’ve become even more convinced that the industry as we know it will die at the hands of its current leaders. Explore collaboration? Isn’t this something several media experts have been expressing for years? And take six months to “explore?” How many more jobs and readers will the industry lose during this exploratory phase? How many newspapers publishers will stop their its presses because they can no longer afford to run them? I’m glad API hosted such a summit. They’ve been very forward in trying to help newspapers redefine themselves through innovative programs such as Newspaper Next. But, they brought together the wrong people. 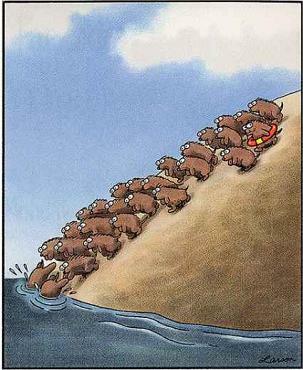 Industry leadership, as evidenced by some of the reaction to Newspaper Next, have basically been a group of lemmings just waiting for someone to lead them to the water. Anyone can take the lead … just not them. Come back in six months? Sure … maybe a few of us will still be around. API didn’t need the executives in that room last week. They needed the folks who know better than to walk off the cliff, but have the experience and knowledge to find a path to a new business model. Guys like Steve Outing … Rob Curley … Howard Finberg. They recognize the disruptive forces that are adversely affecting the industry. Maybe locking them in a room with some corporate turnaround specialists, they can develop a model that an “alpha” dog of a newspaper publisher can test and modify into something that can save the industry. I used to think change needed to come slowly to the industry, but a generation of neglect and indifference to a changing market and readership has put newspapers in the crisis its in now. The collapsing economy has only hastened the emergency. We need more alpha dogs and fewer lemmings. Until that comes about, I’ll continue to lose sleep. UPDATE 11/18 12:40 p.m.: Steve Outing Twittered my idea of locking him up with a few other “websperts” and corporate turnaround specialists. Not sure if he favored it, and in retrospect I think “locking up” may be a bit harsh (not to mention being locked up with corporate-suit-types may violate the Constitutional protection against cruel and unusual punishment.) Thanks for the shout-out, Steve. Outing’s blog today has a response from a participant of the API summit, who clarifies the six-month timeframe was not correct. Read it here. It’s nice to know that the leaders there recognize the immediacy of finding solutions without waiting for someone else to do it. But it won’t affect my sleep patterns just yet. Video journalist and emerging media expert Michael Rosenblum wrote a wonderful “open letter to a newspaper editor” on his blog, following up on a speech to the Society of Editors in the U.K.
It’s a follow up to a question one editor asked: Whether he should put video on his Web site. A simple no-brainer answer, but Rosenblum takes it one … no maybe four or five … steps further by suggesting you could actually build a revenue model around video. By using video to supplement your sagging classified market, use video to advertise services and mark occasions (Rosenblum mentions video weddings and charge for the service). Not really a traditional service of newspapers, but why not? By doing so, Rosenblum concludes, you make your paper “into the video information and public discussion node for your community.” Translate back to my previous postings that local will be the battleground for newspapers’ survival. You own your market, and you will live to print another day. Unfortunately, I still think too many local publishers are blind to the potential video has for the Web in local news AND advertising. They still look at it as TV for the Internet and oftentimes are misled by the photographers that still look at video with an editorial/advertising bias. Frankly, any newspaper that still has the word “Publications” in its corporate title probably won’t get it. You do what Chicago Tribune columnist and blogger Eric Zorn recently did. You stop accepting comments from your readers. I can certainly understand Zorn’s reasoning. The ability to post comments anonymously to blogs and mainstream web media has unleashed a tsunami of commenters who think the First Amendment’s freedom of speech provision gives them the right to say whatever they want, regardless of truth, logic or without regard to others’ plights of feelings. Unfortunately, they don’t realize that “Freedom of Speech” is a misnomer. While it does guarantee that government cannot infringe on speech rights, it doesn’t allow complete freedom. If that were the case, then libel and slander laws would not exist. Nonetheless, these folks who hide in anonymity and post vicious, untrue and or downright tasteless comments have seriously clouded the forum of debate and discussion that was the basis of Web 2.0. It’s a problem for all who all commenting, and Zorn is not unique to the situation. However, to eliminate all comments from your blog is, basically, a big step backward into Web 1.0. The whole basis for blogging is to create a community for discussion and debate. Without this, you revert back to the one-way dialog. You’ve cut the heart out of your blog. And, if one compared these anonymous commenters are the al-Queda of Web 2.0, wouldn’t you say that by ending commenting, the terrorists have won the battle for Web 2.0? Frankly, I’m a firm believer that if you’re not willing to put your name and face behind what you say, then I doubt you really believe what you say. And I think Eric Zorn also believes that. But it’s a shame that he’s thrown the baby out with the bathwater. The commenting communities in Web 2.0 are indeed a wild west. We need more bloggers out there — especially in the mainstream — to fight to bring balance and sanity to web discussion and debate. It’s sad that a good one has given up the fight. Something happened today that earned President-elect Barack Obama my full respect. Yes, I did vote for him, but not because I thought of him as the definitive candidate. I still have concerns about his ability to be a strong leader and am eagerly awaiting to hear who he’ll have surrounding him as his closest advisers during these troubling times. But today, he did something that was truly impressive. And it didn’t involve the economy, the war in Iraq, or picking a transition team. In the morning, he and his wife went to their children’s school in Chicago to attend teacher-parent conferences. Think about it. Here is someone who only days ago was handed the keys to the most powerful country in the world. Someone who has been built to almost Messiah status by the millions of Americans cast ballots for him and now are looking for him to lead America out of the economic morass it’s dealing with now. He could have easily spent the morning cloistered with advisers, business leaders, political planners and international experts trying to develop plans to solves the country’s wrongs. But, instead, he chose to be a dad to his two daughters. I’m sure that the challenge of balancing family time with the needs of America and the world will be far greater once Obama takes office. But for this moment, he’s showing that he won’t abdicate his responsibility as a father in order to achieve his career goals. And because of that, I feel a bit more comfortable that the new president will have his priorities in order when he steps into the Oval Office. — The New York Times and Chicago Tribune printed 50,000 more copies of the Nov. 5 edition after papers sold out. — People lined up at the Chicago Sun-Times printing plant to obtain copies of the paper. — In Atlanta, Detroit, Denver, Dallas, Birmingham and many other cities, circulation directors found newsstands empty as people bought up every copy they could find. When an event of historic proportion occurs, people want mark the occasion – and make it personal – with a keepsake. Traditionally, that has been the day’s newspaper. As wonderful as the web and social networking has made the dissemination of news, one thing that it can’t do is provide a tactile, lasting memory of history — whether it’s the election of the nation’s first black President or the engagement announcement of a family member. They want something they can put in a bookcase and pull out to show future generations. Web sites and social sites like Facebook can chronicle history, but are not tactile. They are too focused on the present to preserve the moment of the past. Twitter’s history is fleeting. I wonder — and worry — what we’ll use to mark history in the 2012 election.